Before I was due to go into hospital last week for a small operation, I saw in a charity shop this plaque displaying three Celtic goddess. Of course the goddesses had to come home with me and I regarded my find as a good omen. When the anaesthetist at the hospital told me to think of something happy while I was going under the general anaesthetic, the image of these three goddesses came into my head and I felt I was being looked after and was sure I would be okay. The op went fine and I was home again as quickly as possible. Of course the credit must go to the wonderful staff at the hospital, but I'm sure my goddesses were looking after me too. While recuperating, I did a little research into the three goddesses on the plaque. The label on the back said that it had been bought in the Roman Baths Shop at Bath and showed the Celtic Triple Goddess. It also said: "This is a copy of an ancient Celtic carving found near Bath. The triple goddess was a popular household deity in pre-Christian times, representing youth, maturity and old age or, collectively, the power of the great Mother Goddess." 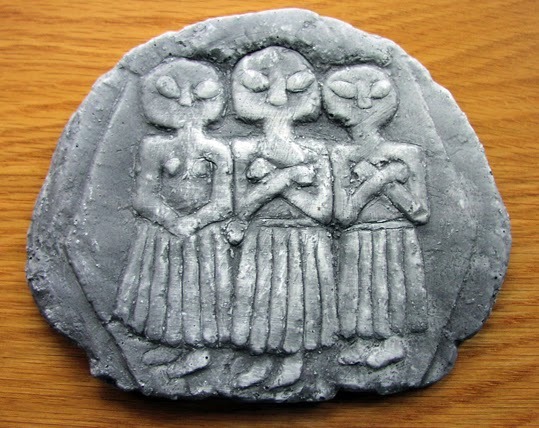 This small stone plaque shows three mother goddesses carved in very low relief. It was found in Bathwick near Bath and is probably from a small shrine. The stone is very unusual and comes from an outcrop at Start Point on the south coast of Devon. The mother goddesses are known from other sites nearby in Gloucestershire and are often shown in groups of three. Representations of them can be seen across Europe, especially in the Rhineland. There may have a common origin with the deities known elsewhere as the three graces. My plaque has been by my bed for the past few days, but I am going to find somewhere suitable to hang it where I can light a candle from time to time to honour the three goddesses.